The BladeRF is a software defined radio that has transmit and receive capability. Over on his blog, Clayton Smith has recently posted about his experiments which involve using the BladeRF to transmit DVB-T digital TV on one laptop to another laptop running an RTL-SDR in DVB-T mode. This is one of the few applications where the RTL-SDR is used as a DVB-T receiver as it was originally intended. Clayton used GNU Radio, a DVB-T package for GNU Radio and some python scripts to create the BladeRF transmitter. The newer Linux kernels have DVB-T support for the RTL2832U chip, so the latest version of Ubuntu 13.10 will be able to recognize the RTL-SDR stick as a DVB-T receiver easily. 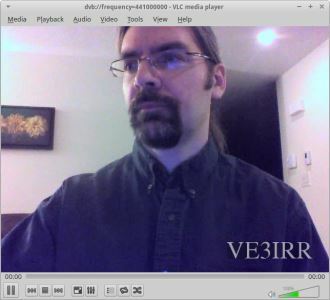 Clayton used VLC in Ubuntu 13.10 to receive the DVB-T signal transmitted by the BladeRF which was tested on the 70cm, 33cm and 23cm bands.